Skateboarding is not a crime! But Trespassing is. 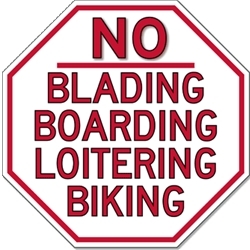 Use this STOP sign to prevent loitering and to clearly mark your property and inform skateboarders, roller-bladers and rollerskaters, and bicyclists of the rules. Signs clearly marking property as private and forbidding trespassing or misuse are the most efficient communication. No one can say, "I didn't know!" When a property owner has posted No Trespassing signs or signs forbidding certain activities. Keep in mind that most law enforcement agencies will not ticket trespassers or skateboarders on private property unless the property has been posted with clearly visible signs.